The Government of the Turkish Grand National Assembly saved the country from being partitioned and occupied with the National War of Independence. A few months following the signing of the Lausanne Treaty, in which the Allied powers and the world recognized the independence and sovereignty of Turkey, the Republican People’s Party was established on 9 September 1923 and Mustafa Kemal was elected as its chairman. The administrative staff of the party was composed of the military staff who directed the national struggle and high-level bureaucrats. The party led by the leader and the hero of the Turkish War of Independence stood for modernizing and westernizing reforms in the political, judicial and educational fields. These developments, however, disturbed the conservative elements in the National Assembly. The discussions flared up on such issues as what would happen now that the sultanate was abolished and how the parliament would now act, with which authorities and on whose behalf. The institutions and the office of the Caliphate, meanwhile stood in stark contradiction to the new administration. All these developments made a radical transformation compulsory. the Turkish Grand National Assembly Building, 29 October 1933. Thus, the Republic was proclaimed on 29 October 1923 in order to give the state a democratic form in the contemporary sense. Mustafa Kemal, the successful and great charismatic leader of the national struggle for independence, was elected unanimously as the first President of the Republic of Turkey. He appointed Ismet Inönü as the first Prime Minister. Thus, the discussions and doubts about the Presidency were ended. Four months later, the Caliphate, which was incompatible with the principle of republicanism, was abolished and the members of the Ottoman Dynasty were expatriated on 3 March 1924. Being aware of the fact that the separation of religious and state affairs and the provision of freedom of religion and conscience for individuals were among the prerequisites of forming a modern society, Mustafa Kemal initiated in the framework of the “principle of secularity” the most important changes. After the abolition of the Caliphate, a series of radical reforms were made in the institutions and mentality connected to the Caliphate. The Ministry of Shariah and Foundations was replaced by the Chairmanship of Religious Affairs and the Directorate of Foundations, both connected to the Prime Ministry. The religious school order was abolished on 3 March 1924 with the Unification of Education Law and all schools and educational matters were united under the Ministry of National Education. The Shariah Courts were replaced by secular courts with the Judicial Organization Law. The wearing of the turban and fez that were symbols of the former order were banned and the “hat” became the official headgear, following the promulgation of the Hat Law on 25 November 1925. Thus, the traditional symbols in attire, indicating differences of class, rank and religious order were removed. The international hour and calendar systems were adopted on 26 November 1925. The dervish lodges and tombs and the titles of tariqahs (sects) were abolished on 25 November 1925. A Turkish Civil Code was accepted on 17 February 1926 to replace the old civil code and the Shariah Laws which were the foundation stones of Ottoman law. The acceptance of the Turkish Civil Code made it necessary to secularize all legislation and the Code of Obligations, the Criminal Code and the Commercial Code were also rewritten according to contemporary principles. Important steps were taken concerning women’s rights. Polygamy was forbidden and marriages, to be officially recognized, had to be performed in accordance with the civil code, not according to religious ceremonies as in the past. Also, a law was promulgated which made it necessary to get a court decree to get a divorce. Women obtained the right to vote and be elected in the municipal elections in 1930, in elections held for village councils in 1933 and in 1934, they obtained the right to vote and be elected into the Turkish Grand National Assembly. One of the most important reforms initiated by Atatürk was the preparation of a new Turkish alphabet by a board of linguists and academicians and the law which envisaged the use of Latin letters was adopted by the TGNA on 1 November 1928. The adoption of this new phonetic alphabet was an important step taken to help increase the literacy rate which had been very low. The old units of measurement and weight were changed in 1931. Commercial and economic transactions were facilitated with the acceptance of the metric system and a standard system of measurement was established throughout Turkey. The Surname Law was adopted on 21 June 1934. Mustafa Kemal, the founder of the new Turkish State and Republic, was given the surname of “Atatürk” (Father of the Turks) by the TGNA. The efforts to create a modern country based on secular foundations was also reflected in the Constitution. An amendment made to the Constitution in 1928 removed the clause which had stated that the religion of the state is Islam. A clause was put in the Constitution in 1937 stating that Turkey is a secular state. Along with these developments, Atatürk established the Turkish Historical Society in 1925 and Turkish Linguistic Society in 1932 in order to strengthen the foundations of the new national state and contribute to the development of a national consciousness among the Turkish people. The struggle for independence the Turks waged against the imperialist states and the radical social, political and economic reforms initiated by Atatürk, constituted an important example and model for the Third World countries. Atatürk realized the reforms with the leadership of the Republican People’s Party (CHP), which had been established not as a party of any class or group in the society, but as a party of all the people, and these reforms were adopted by the people. A short time after the CHP was established, the first experiment for a transition to a multiparty system was made. 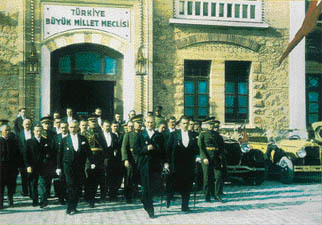 The opponents of the secular and modernizing policies of the government, and who thought that the reforms were not compatible with the social and political structure of Turkey, including a group of commanders from the National War of Independence, such as Rauf Orbay, Kazim Karabekir and Ali Fuat Cebesoy, resigned from the CHP and established the Progressive Republican Party on 17 November 1924. Kazim Karabekir was elected as the chairman of this first opposition party. The Party was “conservative”, not “reactionary” both regarding its program and the mentality of its founders. However, because it was the only opposition party, those whose interests were harmed by the reforms, supported this party, thus escalating the political passions. In fact, many who were against the Republic and secular developments joined this party. Meanwhile, the reactionary Sheik Said rebellion broke out in Southeastern Anatolia and the government closed the Progressive Republican Party on 3 June 1925. The second experiment with multiparty democracy in the Atatürk period, started with the establishment of the Free Republican Party on 12 August 1930. The Free Party was established with the approval of Atatürk himself. The party was established by Fethi Okyar, the former Prime Minister who was known for his opposition to Ismet Inönü. However, the new party grew at an unexpectedly rapid pace. The reactionary powers against the Republic, which also made use of the problems created by the world economic crisis in 1929, started to use the new party for their own objectives. Especially, due to the unfortunate events which occurred during Fethi Okyar’s trip to Izmir, the party dissolved itself on 17 November 1930. The Republic administration first of all adopted a model based on private enterprise for developing the backward economy it had inherited, but in time it was forced to adopt statism to an increasing degree. During the Atatürk period, a foreign policy was followed based on the borders of the National Pact of 1920 and on peace. As the result of successful diplomacy, the Montreux Agreement was signed in 1936, ensuring that the Istanbul and the Dardanelles (Çanakkale) Straits were included in the national defense system. Friendship policies to be followed with all the neighboring countries were made widespread with the Balkan Pact in 1934 and the Sadabad Pact in 1937. The peace policy aimed at Europe and a correct evaluation of the international conditions made it possible to have Hatay rejoined to Turkey. Hatay, which had previously been given to the French, was first given independence and then it was rejoined to Turkey as the result of a referendum. Meanwhile, the League of Nations, refusing the Turkish requests, decided that the Mosul and Kirkuk regions should stay under British control. Hatay was the final foreign policy problem in which Atatürk took an interest. Atatürk, with his dynamism, strong intuitions, accurate assessments of the balances of power and correct evaluations of domestic and foreign conditions, left behind a state which had heartily adopted the reforms and modernized institutions, which had taken significant steps in the direction of the Western model when he passed away on 10 November 1938. 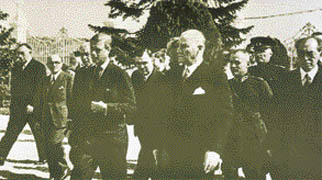 Ismet Inönü was elected as the second President of the Republic following Atatürk’s death. He was the President and the party chairman at the same time. He led Turkey during the most difficult years of both the world and Turkey. He tried to overcome the difficulties stemming from the world economic crisis with a policy of statism during the period when he was the Prime Minister. He wanted to develop industry by means of the State Economic Enterprises (SEEs) and took important steps in this direction. 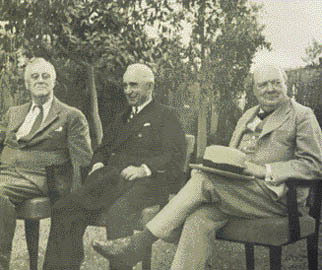 together in Cairo, Egypt, in December 1943. Inönü’s greatest success was in keeping Turkey out of the Second World War. His policy in this regard was based on establishing various balances at the same time and insisting adamantly on neutrality. When the Soviet-German Agreement was signed on 23 August 1939, Inönü thought that this agreement could harm Turkey and signed agreements with France and Britain on 13 October 1939 and obtained economic aid. Later he signed a nonaggression pact with the Soviet Union on 25 March 1941. In June 1941, a few days before Germany attacked the Soviet Union, Inönü signed a nonaggression pact with Germany. This policy of balances continued throughout the war. When the war was about to end, Turkey sided with the USA, Britain and the Soviet Union and declared war against Germany and Japan and signed the United Nations communiqué dated 24 January 1945. Turkey, which was officially invited to the San Francisco Conference on 5 March 1945, was among the founding members of the United Nations. Turkey did not enter the Second World War, but was negatively affected by the war. Throughout the war a large army was kept alert and ready, prices increased rapidly, many of the basic food items were rationed, many items could not be found or were sold on the black market.Inönü who was a farsighted statesman and politician, not only sensed the winds of freedom and democracy which had started to blow throughout the Western World after the Second World War, but also could not remain as a bystander to the social reactions stemming from the problems of the war. In fact, he first mentioned the necessity of “liberalizing the regime” in 1945. Subsequently, he started talking about “the need for an opposition party”. He received with democratic tolerance the birth of the Democrat Party from within the CHP, its flourishing in 1946 and its coming to power with the 1950 election. The Republican People’s Party (CHP), the ruling party, was also influenced by the winds of freedom and democracy that started to blow throughout the world and especially in Europe towards the end of the war and after the war. A strong opposition movement appeared from within the party which complained about the oppressive management of the party and wanted more freedom and democracy. The tolerant attitude of President Inönü also encouraged this movement. Celal Bayar, Atatürk’s last Prime Minister and Refik Koraltan also joined this opposition movement which was led at the beginning by Fuat Köprülü and Adnan Menderes. These four deputies of Parliament filed a famous motion to the Parliamentary Group of the CHP, which was later referred to as the “Quartet Motion”. They wanted to change the party regulations and some of the laws. Following the refusal of their motion, Bayar resigned from the CHP and from the Parliament. Menderes, Köprülü, and Koraltan were expelled from the CHP for not conforming to party discipline. Bayar, Menderes, Köprülü and Koraltan established the Democrat Party (DP) on 7 January 1946. The establishment of a new party was met with enthusiasm by the people who had become tired of the oppressive policies of a single party rule. The DP which defended a liberal economic approach and democracy, developed rapidly in a short period of time. It succeeded in entering Parliament in the 1946 elections and came to power as a single power in the 14 May 1950 elections. Thus, the single party period ended in Turkey and for the first time a change in power was realized with the votes of the people. The DP increased its votes even more in the 1954 elections and strengthened its power. Although it lost votes in the 1957 elections, it remained in power until 27 May 1960. The DP brought a noticeable liveliness to the economy and increased the living standards of people substantially during its 10 years in power. The economy developed, the earnings of the people increased, many villages were provided with roads, water and electricity. New areas were taken under cultivation, agricultural mechanization started, trade was accelerated and important steps were taken for industrialization. The period of orienting foreign capital and commercial capital to industry was started. Close cooperation with the United States that had been adopted during the Inönü period acquired new dimensions in the foreign policy of the DP period. The visit to Istanbul of the US warship Missouri in 1946, the start of the first military and economic aid from America with the implementation of the “Truman Doctrine” and the “Marshall Plan” strengthened the Western-oriented foundations of the Turkish foreign policy, which had been laid by Inönü. Turkey participated in the Korean War, became a member of NATO in 1952 and foreign capital investments and petroleum explorations by foreigners were encouraged during the DP period. 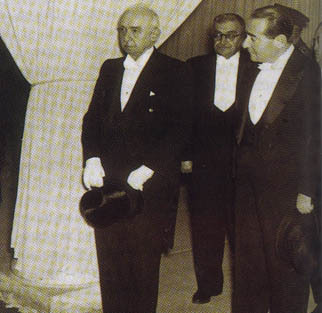 Prime Minister Adnan Menderes at a reception. The DP started to lose the support of the people as of 1954. The main reasons for this were the end of favorable cycles in the foreign markets and a slow down in economic growth. In particular, rapidly increasing inflation upset the financial situation of the fixed income population in urban areas, the military and civilian bureaucrats. Along with the dissatisfaction of the people, the criticisms of the opposition and the media became stronger. In response to the criticism, the ruling party took measures which indicated that it had lost control and started to resort to antidemocratic methods. The obstacles which Inönü faced during his tours of the country, increased the censorship of the press and finally, along with the establishment of an “Investigation Commission” a widespread debate began on the regime in Turkey. The university students started demonstrations. The situation became even more tense with the declaration of martial law and eventually led to the military intervention of 27 May 1960.